Kurdistan Iraq – The day broke with clear blue skies and the 111 degree heat soon followed. 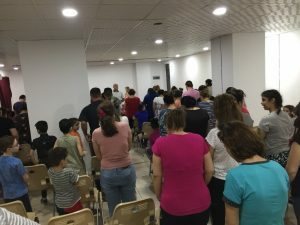 That afternoon in the week of July 23rd, the IM Iraqi team arrived at a refugee camp for a time of worship, songs and a message from the Word. Since 2014, the relationship between the church and the camps has been growing. IM has partnered with them both, bringing them together through many relief supplies over the years to several camps including this one. With so many families’ fate still in the balance and nowhere to go, they welcome the friendships, encouragement and the help for their children through the Refugee Child Sponsorship Program. Pastor Sabri shared about the feeding of the 5,000, and how the faith of the little boy was used by Jesus to bless many. Our faith must be like that of a child, he explained, and then after sharing the Gospel, asked for those who wanted forgiveness for their sins and ask Christ into their lives to stand. Every one of the approximately 125 in the room stood. Men, women and children who live together in this refugee camp found salvation that day. An hour later as the team called the IM Colorado Springs office to share this news, we were overjoyed! What a day of rejoicing and praise at seeing so many respond to the message! Would you pray with us over their new spiritual journey? The church team is working on meeting with the new believers in Bible study as often as logistics and resources will allow. This is exactly why we felt God was leading us to start this Refugee Child Sponsorship Program: to engage the national pastors and church in a relationship with refugees together in the Lord. Are you sponsoring a refugee child? You’re part of this Day of Salvation! Have you contributed towards a Trauma Kit of a plush animal and a solar powered player with the Bible in their language on audio? You’re part of this Day of Salvation! Now these families will be able to listen to the Bible in their own language. Are you sponsoring a national pastor? You’re part of this Day of Salvation! Jesus Christ came to bring healing and hope to a hurting, broken world. God uses people like you and our teams in Iraq to be the hands and feet of Jesus to these refugee families. Listen, we all enjoy eating out…the cost for two people at dinner now is about $40…or, what it costs for one month of sponsorship. Why not cook at home just one night a month and change a life? The heat is on…we have 160/1000 children sponsored!